Adapted from the RPG game of the same name, most popular known as Swords of Legends 2 aka Legend of the Ancient Sword 2 (古剑奇谭二), the ancient drama stars Fu Xin Bo, Ying Er, Aarif Rahman, and Dylan Kuo. The story structure is similar to part one, a bunch of youngsters gather together to fight evil. Are you ready for three lifetimes of torture? Lol. Opening themesongs are revealed for two dramas that will be contending in the ratings game with General and I nearing its last leg of episodes. Smart move to air earlier. 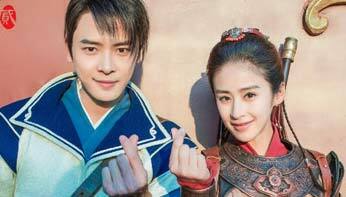 Yang Mi‘s Three Lives Three Worlds Ten Miles of Peach Blossoms and Jing Tian‘s Glory of the Tang Dynasty. On the one hand, I still do not feel much for the OTP of 3L3W but their secondary and tertiary couples are looking cute and their songs are pretty on the dot to steal my little heart. On the other hand, while Tang Dynasty is on the down low with promos, I’m more inclined to check it out, thanks largely to the intense trailer, Jing Tian’s charms, and the wagon of cast members from Legend of Chusen. I need to see them in something worthwhile of their talents. Yes, that’s a shade at you, Chusen! Ah! While I don’t dig the main couple of this drama (yet), the first song from their soundtrack hits all the right notes for me. 3 more weeks to go before the official airing date of Three Lives Three Worlds Ten Miles of Peach Blossoms (三生三世十里桃花), a drama adaptation of Tang Qi Gong Zi‘s novel, depicting the lives of two immortals as they are teared apart in one lifetime and given another chance to meet through another form of themselves. Yang Mi and Mark Zhao portray the twisted OTP. More stills, posters and the song after the jump. EDIT// Just added in the official MV for Liang Liang. First posters are out for two period dramas that started filming last winter, which seemed like a long time ago. Lol. One is the historical drama Rule The World and the other is based on video game, Gu Jian Qi Tan 2 or Legend of the Ancient Sword 2. Three Lives Three Worlds, Ten Miles of Peach Blossoms (三生三世十里桃花) is the drama adaptation of Tang Qi Gong Zi‘s novel, depicting the lives of two immortals as they are teared apart in one lifetime and given another chance to meet through another form of themselves. Yang Mi and Mark Zhao portray the twisted lives.